"Roland." For the millions and millions of fans of the smash-hit video game BORDERLANDS, a lingering question exists: how did the Vault Hunters get on the bus with Marcus in the first place? Find out how Roland got on the bus with Mordecai, Lilith, and Brick in this exciting look at the soldiers of the Crimson Lance and what made him leave their ranks and search for the Vault. 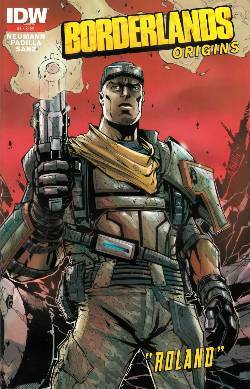 Surprises abound in the first part of a four-issue series chronicling where Borderlands began!